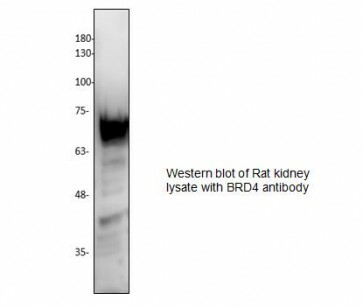 BRD4 Antibody | 6283 | BioVision, Inc.
Rabbit polyclonal antibody to detect BRD4 in human mouse and rat samples. The acetylation of histone lysine residues plays a crucial role in the epigenetic regulation of gene transcription. A bromodomain is a protein domain that recognizes acetylated lysine residues such as those on the N-terminal tails of histones. This recognition is often a prerequisite for protein-histone association and chromatin remodeling. 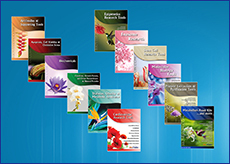 These domains function in the linking of protein complexes to acetylated nucleosomes, thereby controlling chromatin structure and gene expression. Thus, bromodomains serve as “readers” of histone acetylation marks regulating the transcription of target promoters. The BET family of proteins, defined by tandem Bromodomains and an Extra Terminal domain, include BRD2, BRD3, BRD4, and BRDT. The BET proteins play a key role in many cellular processes, including inflammatory gene expression, mitosis, and viral/host interactions. The isolated individual or tandem bromodomains of BRD2 and BRD4 have been shown to bind acetylated histone tails, serving to couple histone acetylation marks to the transcriptional regulation of target promoters. Small molecule inhibitors of these interactions hold promise as useful therapeutics for human disease.